Though the Dog Days of Summer are coming to an end, Miamians can still celebrate by savoring one of the season’s most popular food – hot dogs, of course! 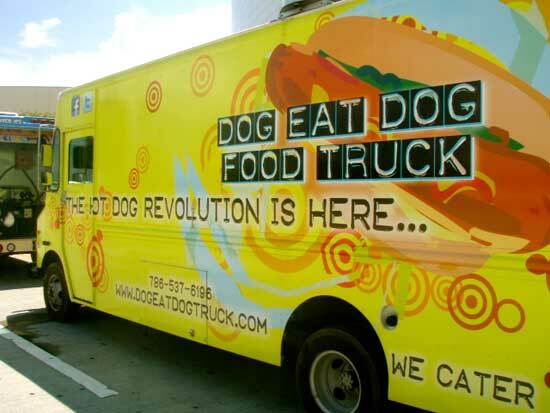 Dog Eat Dog: The Hot Dog Revolution food truck will have you eating this summer staple all year long. Ordering the Asquerocito ($6.50) was a slam-dunk decision. Although the name translates to “disgusting” in English, I can assure you there’s nothing gross about this dog. It comes topped with generous helpings of cheese, shoestring fries, raw onions, mayonnaise, and ketchup. Sure, the calorie intake is a tad bit high, but it’s okay, because if you’re going to take a diet diversion, this is worth it. 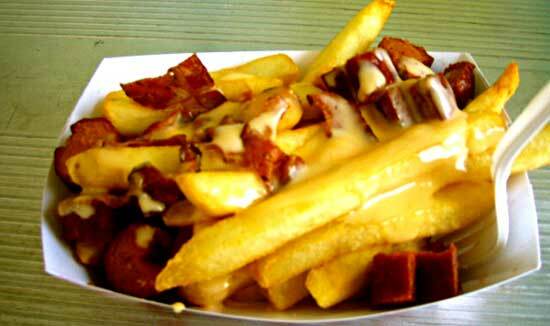 To go along with my dog, I ordered Salchipapas ($4.50), a mix of cheese fries, bacon and sausage bits. It’s a whole lot of goodness with bold flavors that are sinfully good when paired together. Fried pickles ($4) also made my A list. They are covered with a crunchy battered layer that doesn’t overpower the pickle’s taste and freshness, and comes with a side of ranch for dipping. There really is a gourmet option here for ALL hot dog lovers. Vegetarians can request a veggie dog instead of beef with any item on the menu, and add some Portobello mushrooms, zucchini, caramelized onions and cheese. For meat lovers, I suggest the Choripan ($6), which is an Argentine style sausage with truck-made Chimichurri sauce on a French roll. 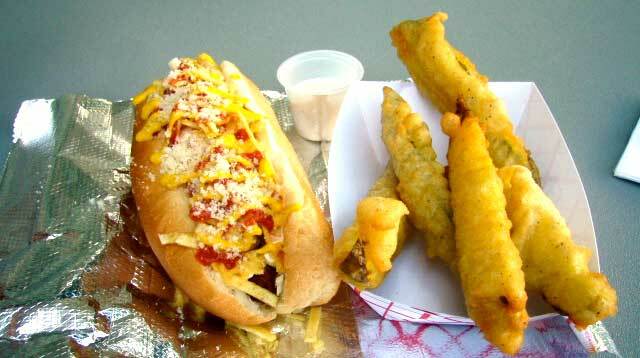 You’ll find classic Chili Dog ($6), and one-of-a-kind creations, such as the 305 Dog ($6), which is wrapped in bacon with pineapple poblano sauce and shoestring fries. For an extra kick, delicious shoestring fries can be added to any hot dog selection for only an extra buck! The selection doesn’t stop there. The menu also includes an After Dog ($4), a dessert hot dog smothered with caramelized banana, Nutella and marshmallow sauce. Go take a bite out of Dog Eat Dog: The Hot Dog Revolution. And tell them you heard about them on GreatFoodList.com. Prices Range from $3 – $7. Good job guys keep it up. good dog food truck , good job !! !